Hello everyone, it’s time for another review in my by now monthly Crónica review series. 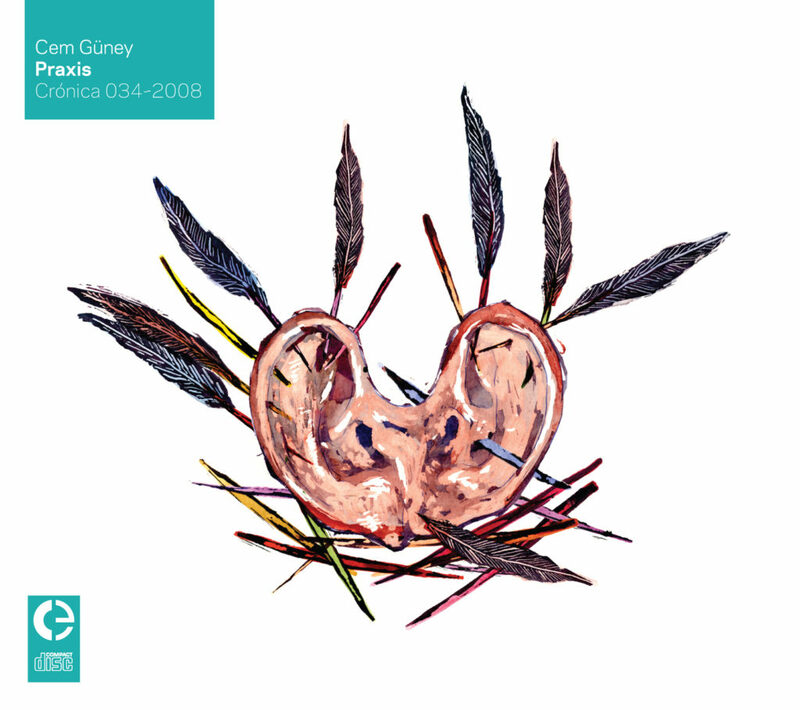 This time we got this excellent album called Praxis by Cem Güney. This is a release on CD packaged in a three panel cardboard gatefold sleeve in which the CD is beautifully housed between two holes and which features sweet artwork on both sides as well as the tracklist and credits. The package is stored in a resealable plastic sleeve so you can store the release neatly after listening, very nice. Praxis is a curious album of electro-acoustic, sound collage and sound art that while I was listening to it sounded quite like an album split in two sides of music. It’s got a pretty clear first half that is “bright” in a way, with the second half being “darker” I noticed. The album kicks off with this excellent piece called A Phonetic Theme which cuts from vocal samples to various other manipulated noise, music, glitches, field recordings in quite a dadaist sound collage kind of manner, really creative and enjoyable piece, pretty funny too, with one man saying “vinegar” at one point. Great glitching and timestretch effects in this one too, Güney goes pretty wild in here. Impulse is a much more gradual piece which features a lot of high pitched sounds, included sine wave beeps, clicking and shaking sounds, as well as a mysterious vibrating repeated motive, stuttered music samples and glitches and various other sounds popping up and then disappearing after some time. What I like about this kind of style is that the progression is pretty slow over time but there’s a lot of sonic colours in the music and it’s got this wild quirky vibe, feeling a bit like the lab of some mad genius professor. Undulations (dedicated to Janek Schaefer) starts of pretty dramatic with a looped vinyl music sample with a lot of tasty crackle sounds added in the mixture too but then moves to a lighter funkier kind of bright drone, in the beginning still accompanied by the vinyl crackles. What makes this drone so funky is the squelchy filter bass synth that’s accompanying the drone with varying tones, alongside the drone all kinds of harmonic and diffuse sounds float in and out including a great resonant “sequenced” resonant series, whooshing sounds as well as field recordings that pop up only once or twice, like the genius addition of the shop P.A. attention sound added at one point in the piece. With the mechanical industrial like sounds in the mixture the track feels quite like the sonic picture of a relaxed day in some workshop where people work wih various kinds of machinery. very peaceful. Visceral (In A Figurative Sense) is more similar to the atmosphere of Impulse combined with a more Industrial edge, an organ / synth drone combined with various high pitched clicks and bloops as well as more machinery sounds, a quirky and playful soundscape of a workshop, nice sound. Factitious Phobia features a very nice low rumbling bass that starts off as these intense “beats” that fade in and sped up making up the very low bass sound of the track. This track can definitely already be seen as a start of the darker side of this album, featuring a more mysterious and abstract atmosphere, a focus more on sound textures and sonic manipulations than melodic content. The piece features various metallic and clicking sounds this time more ear-penetrating and a bit more harsh in the metallic side of it, another interesting element is the Turkish (?) music radio samples that pop up in the mixture at some point and while the delay piano notes near the end of the piece sound pretty funny the piece is still in darker territory than the tracks before, it still feels like a metal workshop setting though, but this changes in the tracks to come. Adaptations features many high frequency sounds, sometimes at earpiercing frequency and is based around a “hovering” mid frequency drone, a theme in the track seems to be space and astronauts as there are also some samples used from an astronauts communication system. Adaptations of more a sound art kind of piece with a lot of emphasis on the high and mid frequency manipulation of sounds to create new spacy and also crunchy sonic shapes, mysterious and intense on the ears, cool stuff. Praxis continues in this style with a lot of high frequency manipulation and LFO manipulation all abound in this piece, a very physical experience of sound, great track. Behold Now Bhikkus, The Sounds of Nada Yoga features a sound that is more like a meditative religious ritual with the extended male vocal choir samples drone in the drone, this is accompanied however by chopped and glitched vocal samples and buzzing manipulated sounds and another second resonant drone that comes in in the second half of the track, mysterious and dark music again, but very nice. Somewhere Between The Middle is more sonic manipulation again, though much longer and with more layers and progression, there’s a mixture of various sounds used, field recording samples (including a pitched up car wiper), delay time / feedback manipulation and other synthetic and organic sounds, all accompanied by a mid frequency drone. Very nice piece again full of curious sonic adventure to dive into and nice closing piece of the album. This entry was posted in Reviews and tagged 034, Cem Güney. Bookmark the permalink. Comments are closed, but you can leave a trackback: Trackback URL.